I’ve decided to set up a system: a treat system. Every week I’m going to dedicate myself one treat to tide me over until the next week. Granted this week there has been more than one, something more along the lines of four but that can’t be helped! After all, the system is still only in its development stage. This weeks treat was a pair of loafers. After eyeing them up in River Island for quite some time and saving them to my online wish list, I took the plunge and bought a pair. And boy am I glad I did. To tell the truth, I’ve never been much of a loafer girl. I did partake a little in the brogue trend but that was as far as I went. However I’ve been swayed. After never really being much of a fan of masculine shoes such as the likes of creepers, I’d put clunky shoes out of my mind. 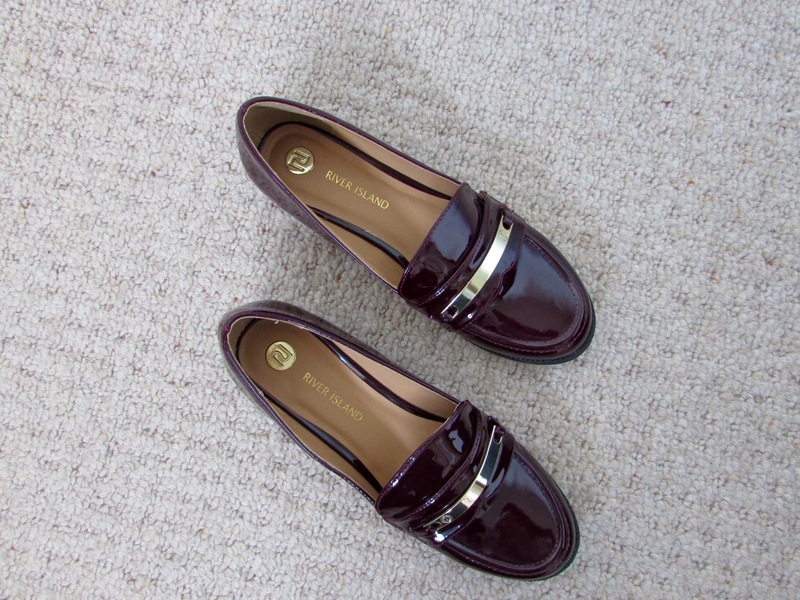 But on seeing these new season loafers, complete with gold bar detail and tan insoles, my mind was changed. Although they are somewhat a ‘masculine’ shoe and my boyfriend’s first reaction was ‘oh. they’re old looking.’, there is something delicate about them. I think the patent leather look and gold detailing gives them a tailored, sophisticated androgynous edge as opposed to the in your face ‘am I a boy or am I a girl?’ question that the creeper poses. Considering the summer months are drawing to a close now, I decided to opt for a deep red colour, fitting in with my ever favourite autumn shade of wine. After revealing them for the first time last night to go for a meal, as a trial run, with a wine coloured peplum top and beige pants, I’m now extremely excited to take them to university with me and discover their ultimate versatility.